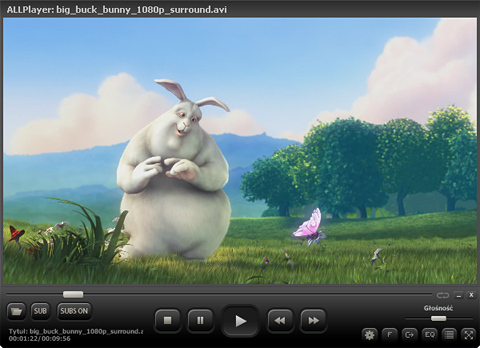 ALLPlayer Portable is a free media player which can be used to play all known formats. ALLPlayer Portable is the first player that enables IQ text function. ALLPlayer Portable Has built in connection to Opensubtitles.org which enables to watch movies with matching subtitles. Subtitles Speaker allows your kids to hear subtitles.There is also available LiveUpdate service which helps to be up to date with the novelties. ...... There is a new function which allows your kids to hear subtitles. ALLPlayer Portable has built in special connectors to the Opensubtitles.org servers that enable to watch movie with matching subtitles in the instant mode. Intelligent Subtitles allows to read all subtitles in long enough display, so nothing will be missed. ALLPlayer Portable has also live updater which keeps you updated with the latest codecs-pack. AVI Doctor helps when you are downloading torrent file and want to preview the movie. With AVI Doctor you can also fix the broken file. With LiveUpdate you will get access to other skins and many additional programs and functions. Give LiveUpdate a try and you will experience a new way of watching movies on PC. You can download a movie from You Tube on your hard drive. Qweas is providing links to ALLPlayer Portable 4.7 as a courtesy, and makes no representations regarding ALLPlayer Portable or any other applications or any information related thereto. Any questions, complaints or claims regarding this application ALLPlayer Portable 4.7 must be directed to the appropriate software vendor. You may click the publisher link of ALLPlayer Portable on the top of this page to get more details about the vendor.